In this furniture painting workshop you will learn all about furniture painting. Great for beginners or if you have been painting a little while and want to learn about a variety of paints. The furniture painting workshop begins with a paint talk to learn all about the variety of paints available and which to use when: chalk-based, enamel, latex, acrylic, milk and all the top coats, glazing and more! Then you will dive in to paint 6-8 samples to learn furniture painting techniques using, chalk-based, acrylic and milk based paints. Painting techniques such as waxing, distressing, layering paints, glazing and more! You will go home with each recipe so you can create the same finishes on your own projects when you leave. You will receive a gift bag with my favorite paint brush and several goodies valued at over $25! This class is scheduled for Saturday, March 2nd from 10:00am til 2:00pm. Registration ends February 28th. Each ticket is $99 per person. All sales are final. No refunds are given unless the class is cancelled. Maximum is 20, Minimum is 4. Be sure to check out our Pinterest boards for ideas and inspiration before the workshop. Share with friends so you can learn together! Have you been curious about creating art with resin but unsure where to start? This class will teach you the proper way to mix and work with resin, various ways to color the resin, how to add embellishments, and much more. 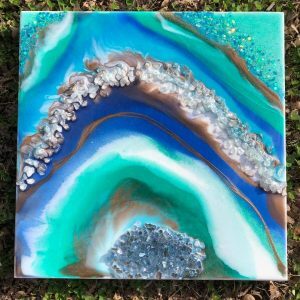 We will create a freeform geode or any style of art you choose on a 12” x 12” board. Class fee includes thorough instructions and a printed take home supply and instruction list, as well as all supplies to create your 12” x 12” art. A wide variety of colorants and embellishments will be available to personalize your masterpiece! Class not appropriate for children, and participants must be able to return within the week to pick up finished project once dry. This class is scheduled on Saturday, March 2nd from 3:30pm til 6:00pm. Registration ends February 28th. Each ticket is $78 per person. All sales are final. No refunds are given unless the class is cancelled. Class Maximum is 12. Minimum is 4.